Below, we shed light on another stunning Magento extension by Xtento. 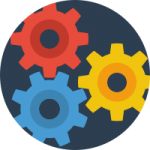 This time the tool is responsible for creating various product feeds for more than 50 third-party platforms and services. Furthermore, if your particular service is not listed below, you can contact Xtento and ask the company to provide you with the desired integration. Usually, this happens for free. For further details, check the following post dedicated to one of the most reliable Magento export managers that implements a highly flexible output creation technique for both Magento 2 and 1. 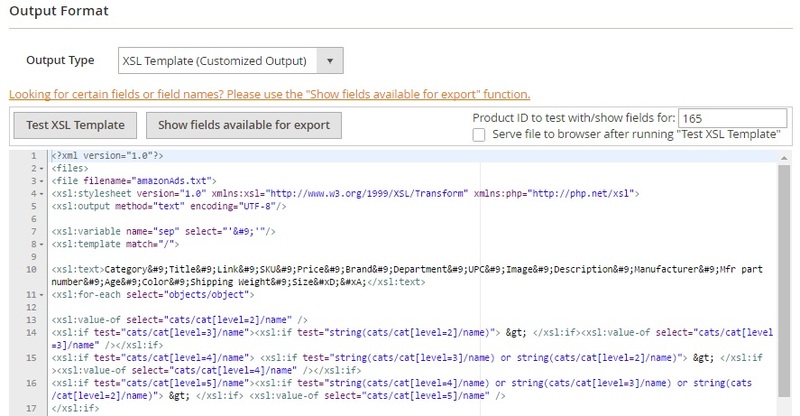 Three core features, you will get after installing the Xtento Product Feed Export Magento extension are: exporting all products into a specific directory; exporting one file for each modified product to an FTP server; sending emails with products weekly to a supplier. 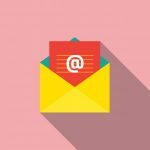 More features are listed below, and now we’d like to tell a few words about XSL Template, which is a part of the module utilized for creating different output formats: TXT, XML, CSV, Fixed-Length, etc. 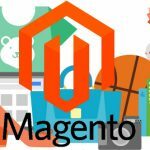 Note that each software, you are going to connect your Magento website to, has its own requirements related to the output format, and XSL translates the internal Magento format into the required one. Therefore, your Magento webserver should support the XSL PHP extension. 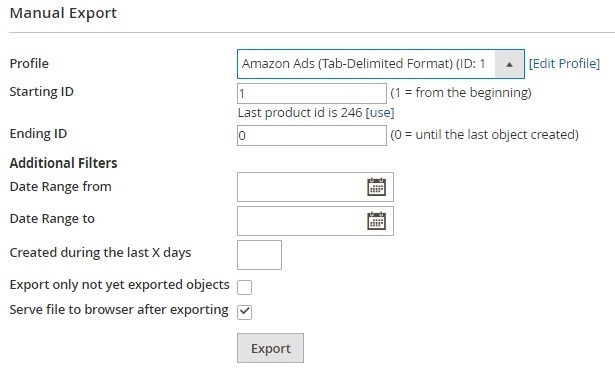 The extension is available under Products -> Product Export, but you can export products right from the grid at Products > Catalog from the Actions dropdown. 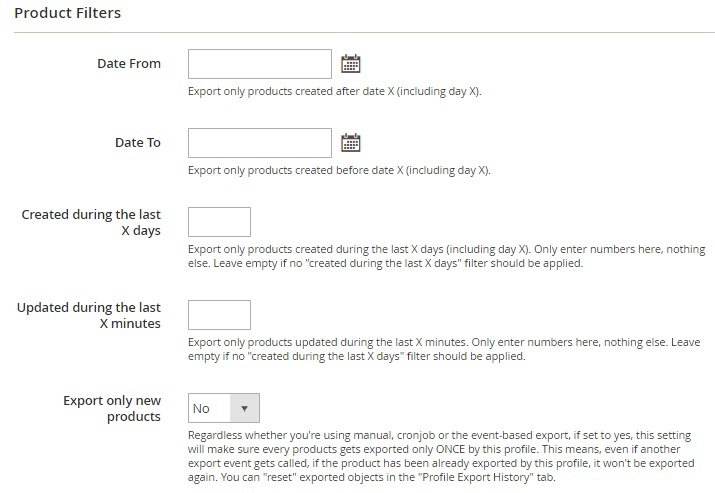 In Manual Export, you choose an export profile, set starting and ending IDs, and apply additional filters, such as Date Range from/to or Created during the last X days. Besides, you can activate two more options: Export only not yet exported objects and Serve file to browser after exporting. Note that you can delete profiles in bulk as well as change their statuses. Besides, all columns except Checkbox and Action supports sorting. 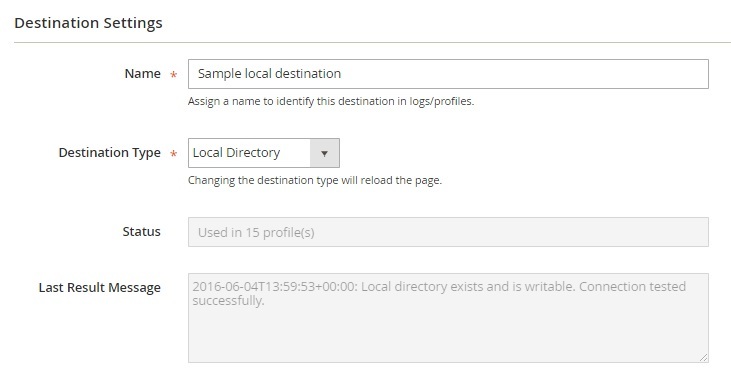 While creating a new profile, you should specify its name and choose export type (products or categories). Next, you have to deal with 8 tabs of settings: General Configuration, Export Destinations, Output Format, Stores and Filters, Manual Export, Automatic Export, Profile Execution Log, and Profile Export History. General Configuration is divided into two sections. The first one contains such data as profile name, status, and export type. The last setting can not be changed. The second section is called Export Settings. It contains such options as Save local copies of exports, Export each product separately, Export empty files, Remove HTML in exported data, Replace new lines in attribute values, and Remove store parameter from URL. While editing a destination, you have to deal with 2 sections of settings: Destination Settings and configuration of the chosen destination type. In the first section, you can edit name and type of the destination. Besides, there are such data as status (used in X profiles) and the last result message. The Stores & Filters tab is divided into 5 sections: Store View & Customer Group; Product Filters; Advanced Product Filters; Additional filters; and Performance Settings. In Store View & Customer Group, you choose both parameters. Product Filters include Date From; Date To; Created during the last X days; Updated during the last X minutes; Export only new products. 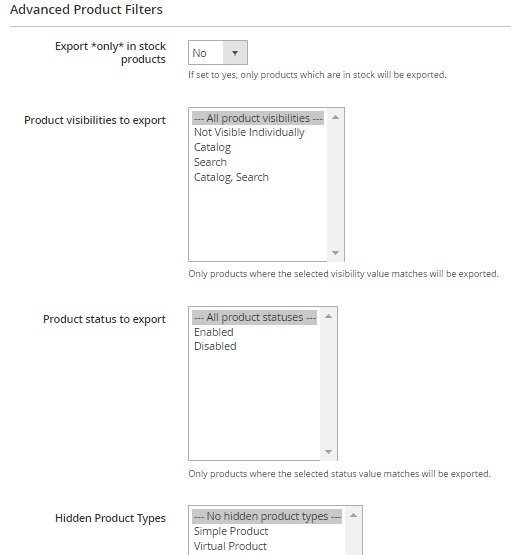 As for Advanced Product Filters, they are: Export *only* in stock products; Product visibilities to export; Product status to export; and Hidden Product Types. Performance Settings can be used to speed up the export. 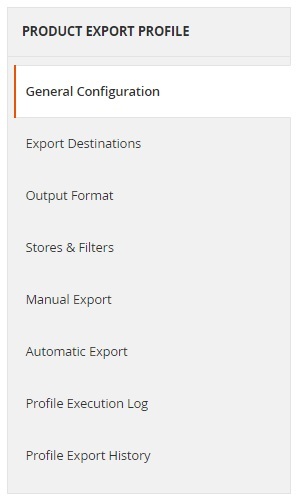 In Manual Export Settings, you can enable/disable the feature as well as choose whether to save files on destinations for manual exports or not and serve files to browser after exporting manually or not. As for the Automatic Export tab, it is divided between two sections: Cronjob Export and Eventbased Export. 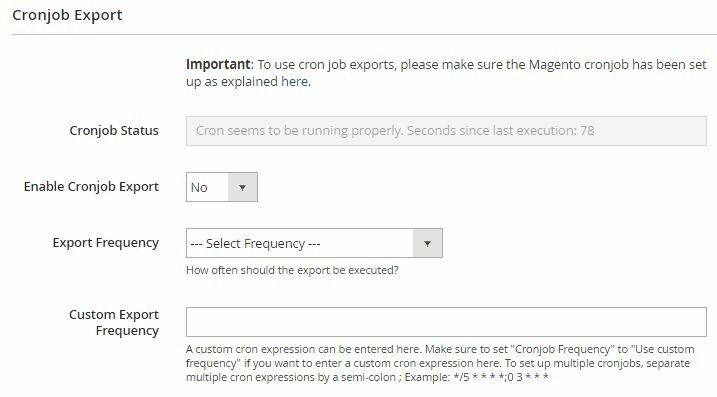 In the first one, you can view cronjob status, enable it, choose export frequency, or set a custom one. 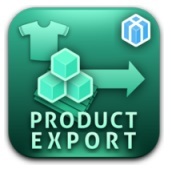 In Event-based Export, you choose events that automatically starts product export. This is Profile Execution Log. All exports are logged here, and you can download each file. As for Profile Export History, all exported objects are logged here. All export destinations are available on the Destinations page in a grid. 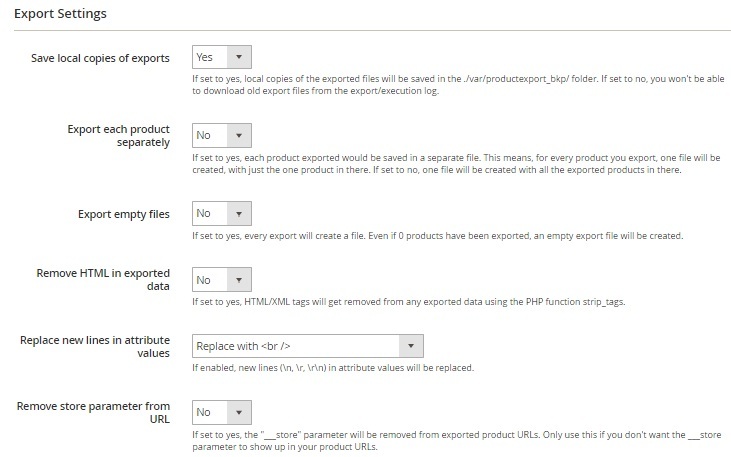 The Tools section of Xtento Product Feed Export Module for Magento 2 and 1 lets you upload previously exported settings as well as import them. 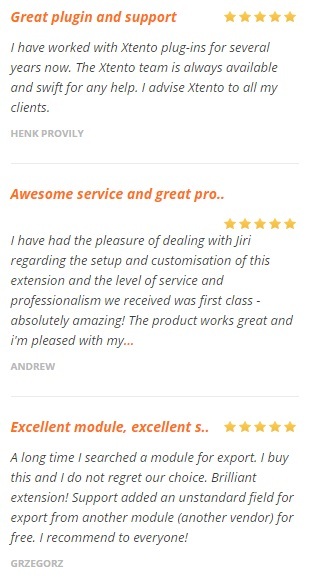 Automated export after a product/category has been modified/created or at predefined time intervals. Being one of the most flexible product export Magento solutions, Xtento Product Feed Export Module for Magento 2 and 1 essentially enhances the default export capabilities of the platform. At the same time, the extension has a quite reasonable price tag – just $129, which is a small investment that will be rapidly returned.